"The gift registry website was excellent and extremely easy to use. Great that you were able to contribute towards gifts that were outside of your price range." "I found your registry easy to use and appreciated the confirming emails." creation of a registry is simple which is good." Registry: "Kate Horne & Ernest E. Christensen's Wedding"
"I like the concept a lot, and also the fact that there are already some default items that remind me of things that I might need. I also like that I can add a picture and a message." 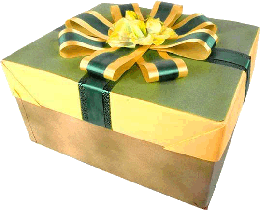 "Thanks for your email - its a great idea for weddings and I guess any other occasion where gifts are required. Definitely an easy way of giving gifts - esp monetary ones." "I think the idea of the wishing well is outstanding. It makes things easier on the Bride and Groom, especially those couples whom have the things to start a marriage together. It makes sense to go this route versus registering at department stores for the same old traditional gifts which you already have in the house." "I very much like your application, I think it's a great idea"
"I thought it was a good idea considering the digital age we live in. I navigated through information and gift registry OK I will certainly let people know of its availability." "I found it very easy and saving a lot of time on both sides. What I like about it is that by filling out information after you put the gift "donation" down, that information goes automatically to the bride and groom so they can send out thank you notes."